How to register: visit Upper Arlington Lifelong Learning website or call 614-583-5333. Learn the basics of proper nutrition, upon which we can fuel our bodies and live our best lives! This presentation covers the importance of the different food groups and how to easily fit them into the diet, which foods to decrease or eliminate, how to read food labels and ingredient lists, the power of protein, functions of fiber and more. Participants receive the Top 10 Tips to Master Nutrition 101. Quite possibly the most stubborn of all places on the body, belly fat is a cause of frustration for many Americans especially after the celebratory, food-centric holidays! During this informative and interactive lecture, investigate the role your hormones, nutrition, and lifestyle play in beating belly fat. Learn strategies to trim your way to a flatter stomach! Beauty isn’t just skin deep; come learn how to unleash your natural glow! What we put into our bodies is as important (if not more so!) than the pricey topical products we put onto our skin. Explore what foods and herbs help give your complexion a radiant and natural glow. Also, discover which minerals work to delay graying hair and learn about particular oils that aid in preventing wrinkles. This interactive and informative overview covers a wealth of easy-to-implement and well-researched tips. Come and learn how to put your best face forward! Did you know that Celiac Disease is one of the most common genetic disorders, affecting 1 in every 133 people? This interactive workshop, given by Registered Dietitian Adrienne Raimo, is designed for the recently diagnosed and others who are curious about living without gluten. The focus will be on making the diet and lifestyle changes necessary to enhance health, being creative in your cooking, and tips for eating at restaurants and while traveling. Come to learn and try gluten-free goodies! Declutter Your Home & Clear Your Mind! Clutter driving you crazy? Put your mind at ease and spend a little time making your home the best environment it can be. In this interactive class, we discuss what defines clutter, learn positive steps to start the decluttering process, explore feng shui principles and set up easy-to-implement routines to make your life and home run more smoothly. The connection between decluttering and weight loss is also addressed. Participants receive a list of top ten decluttering tips to utilize right away to create a home that nurtures and supports their goals and lifestyle needs. With the high-fat, high-sugar, and high-salt diets we have encountered with many of our food choices, people have wondered how to make healthy food taste good. Enter herbs and spices, nature’s flavor enhancers! Many herbs and spices also have health benefits – from increasing beauty to helping to prevent cancer! This class, taught by Integrative & Functional Dietitian-Nutritionist Adrienne Raimo, will cover quick and easy ways to get in the habit of adding a variety of herbs and spices to add a healthy kick to your menu. Various herbs & spices, as well as combinations will be demonstrated and discussed. How to register: visit Upper Arlington Lifelong Learning website or call 583-5333. Nutrigenomics: Science on your Side! Many of us are making a conscious effort to eat better, but have yet to learn about the importance of skin care in overall health. Did you know that hot flashes, allergies, eczema, hormone dysfunction, infertility problems, immune disorders, and cancer could be due to your body care products? Our skin is our largest organ and can become easily contaminated, and absorb, the nasty chemicals in many cosmetics and bath, hair, and perfume products. Children, women, and men can be exposed to as many as 168 ingredients everyday. Take your health into your own hands as you learn how to properly care for your body, inside and out, while conquering acne, preventing wrinkles, reducing toxic load and avoiding skin cancer. Hypothyroidism, or underactive thyroid hormone production, is common in women (and men) over the age of 50, but younger people are increasingly experiencing thyroid issues. In this interactive presentation, explore risk factors, symptoms, the differences between types of hypothyroidism (including Hashimoto’s) and how food can relate to thyroid health. Be proactive in your knowledge about this condition and learn what you can do to improve your thyroid and overall hormone health. 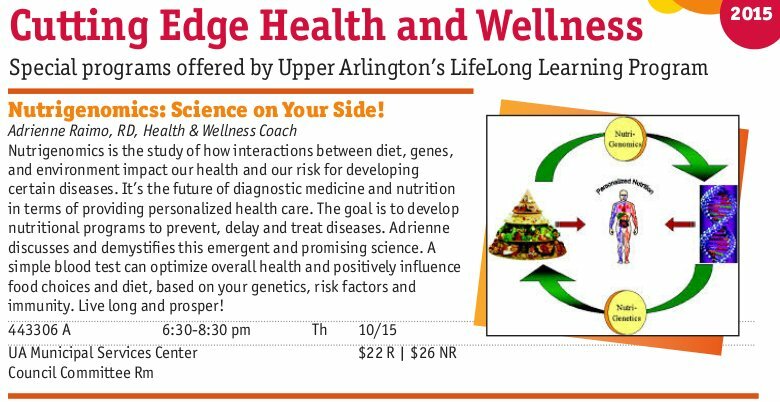 Adrienne Raimo, RDN, LD of One Bite Wellness presents Nutrition: Redefined. Is it possible to permanently change your relationship with sugar and caffeine? In this interactive lecture with Registered Dietitian Adrienne Raimo, we will define sugar and discuss the effects of this all-pervasive, seductive white stuff, from cravings, energy imbalances, weight imbalances, fatigue and mood swings to PMS, diabetes, heart disease, candida, and hypoglycemia. An estimated 90 percent of Americans consume caffeine, whether in coffee or other sources, every single day. Many find themselves addicted to it – for reasons of energy, improving digestive transit, or cutting through ‘morning fog.’ Caffeine’s withdrawal effects including headache, anxiety, and tremors, among others. While many studies have been performed to evaluate the effects of caffeine on one’s health, they are often inconclusive, if not controversial. Participants will also receive information on how to reduce both sugar and caffeine cravings and receive a special offer on sugar and caffeine detox programs designed to help them create the change. During the transition from winter to spring, our bodies can often use a ‘re-set’ from the higher fat and sugar consumption from the holidays spilling over into the early months of the new year. This overload causes an increased burden on our organs and brings on sluggish digestion, poor skin and lack of energy. We will discuss how to effectively transition to a spring diet, drawing from Ayurvedic principles and proper nutrition according to the seasons. Sample some delicious detoxifying foods and learn more about keeping your body in tune for a healthy, vibrant lifestyle. Location: Hilton Columbus Downtown, 401 N. High St.